Oliver Todd was a band leader and trumpet player. He was born in Kansas City in 1916, and was one the city’s most famous band leaders. He lead a band known as the Hottentots which included at various times Tiny Davies (trumpet) formerly with the International Sweethearts of Rhythm, Gene Ramey (string bass), Winston Williams (string bass), Bill Graham (alto sax) and later with Count Basie and Duke Ellington. He also was a friend of Charlie Parker. 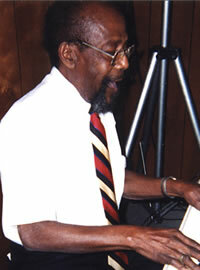 In 1992, he won the Kansas City Jazz Heritage Award. Oliver also was the leader of the Kansas City Jazz Septet + One, which, as it turns out, was the last band he played in before passing away. After his death in 2001, he was for some time interred in an unmarked grave until The Coda Jazz Fund paid for a headstone for him. Oliver Todd was remembered by a local musician, Luqman Hamza, who first played with Todd in 1951, said he always looked up to the man.